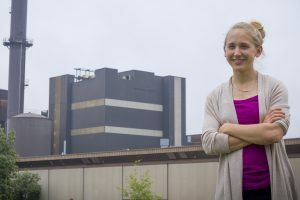 Kristen Cetin stands in front of the Iowa State University Power Plant. Her research on energy production would impact facilities like this one during times of peak usage. Photo by Kate Tindall. Turning up the air conditioner is the first move you make when you come in from a hot summer day. The hotter the outdoor temperatures, the lower you crank the thermostat. Multiply that by thousands of people sweating out a heat spell, and you have a demand that strains even the best power grids. How do we prepare for high-impact climate events, decrease the load to the electric system and provide quality, low-cost service? Kristen Cetin is asking that exact question. “A challenge that cities face when you have these extreme events is trying to maintain reliability of the electric grid,” she said, framing the question that municipalities across the globe face during hot and dry times. Cetin is an assistant professor of construction engineering at Iowa State University (ISU). Her project, titled “Collaborative Research: A Framework for Assessing the Impact of Extreme Heat and Drought on Urban Energy Production and Consumption,” is funded in part through a $625,000 award from the National Science Foundation (NSF). Beginning on Sept. 1, Cetin will pair with faculty from the University of Texas-Austin and the University of Michigan to conduct research. The group will sample consumer data from municipalities in Iowa, Texas and Michigan. That data will be used to produce climate models of extreme conditions and help cities prepare for the increase in demand on the electric grid. Why hasn’t this type of climate modeling been conducted before? Cetin explains that, while climate modeling exists on a nationwide or global scale, little climate modeling exists for smaller, more specific areas. Cities experience unique climate anomalies. Urban heat islands—large, paved areas—is one example Cetin uses to illustrate how parts of a city can experience vastly different temperatures. Develop effective methods for refining future extreme heat and drought scenarios by using varied sources of data. Develop a flexible electricity consumption model integrated with demand-side management strategies using bottom-up energy and demand-modeling methods. Bottom-up energy methods are models that begin at the building level and are scaled to create a prediction of consumption and demand at the city level. Develop a data-driven method for determining power-generation strategies while considering sources of uncertainty (weather, electricity production/consumption, etc.). Cetin is the principal investigator of this project. ISU Department of Geological and Atmospheric Sciences Professor William Gallus and Assistant Professor Yuyu Zhou are co-principal investigators. The project is estimated to last through August 2020. Read more about this research by visiting the research abstract. Read about all our engineering research by following Iowa State’s Department of Civil, Construction and Environmental Engineering on Facebook, Twitter and LinkedIn (Iowa State University Civil, Construction and Environmental Engineering and ISUConE).